Dang, didn't realize that Fowler owned all three of those gas stations, as they are some of my favorite structures in and around Durham. What is up with people like him? I'm fairly sure, but not 100% certain, this is the same dude who is putting those annoying as hell digital advertisements to go along with the digital gas price signs at his active gas stations across town. anyone know if this is correct? Why can't the city go after Fowler for code violations? These buildings aren't safe and fire hazards. Maybe a little pressure and he'd sell to people who actually care about them. And what is his purpose for buying them and then letting them rot? Agree with Retro on the possible uses of this gem. MM Fowler inc. purchased in March 2007 for $185,000. 4.5 acres & a 720 square foot store. I don't suppose a well-orchestrated public humiliation compaign could have much effect on a company like MMF, Inc.
Gary, totally OT to Bragtown, but would the old Peggy Mann mansion be on your list of future posts? That might be a fun one if any clips of her tv show still exist. MM Fowler is the reason Durham has such high gas prices ! Not a particularly good team player at all !Has a monopoly on most of the gas stations in the area. Well, why didn't one of you buy the Catsburg store? $185K for 4.5 acres isn't exactly a king's ransom. We all expect (me included) that guy, "someone else" to take on the expense and risk of historic preservation. PS - Having met him twice, MM Fowler is an affable gentlemen. Who knows? Something might be able to be worked out. I think there are people more than willing to buy the three properties I reference from MM Fowler. I can attest in particular to the gas station on the corner of Geer and Foster; I know of at least 5 people who have called regarding acquisition of that property and not had their calls returned. It's a common salvo I hear - "why don't you fix it up?" That's rarely if ever the problem, at least in Durham, with abandoned property. In 12 years of working on this issue in Durham, I can say that ~ 2/3 of the time, the owner refuses to sell the abandoned property, and ~1/3 of the time, they have a non-reality-based opinion of the property's actual economic value. There are at least a dozen developers who have tried everything they know to buy the Foster/Geer gas station from him. He won't even return phone calls. Tar Heelz, if you've met him, please try to talk some sense into him. "~ 2/3 of the time, the owner refuses to sell the abandoned property, and ~1/3 of the time"
Dang: the math on this says there's only the tiniest fraction of a space for someone to do something good. Dang. Regarding Catsburg: in the background you can see the old Mitsubishi Semiconductor scoreboard that was put up sometime in the late 80s. My dad was employee number ~10 at the company which started in UDI before building several plants around the corner from Catsburg. The first plant went up in ~1986 and many of the staff went down to Catsburg after work to drink beer and play ball. I seem to remember that scoreboard conversation between the then-Catsburg-owner and the then-Mitsubishi management wasn't exactly smooth. My sense was that in exchange for buying the scoreboard, Mitsubishi wanted to get a lot more branding than Catsburg wanted to give. But who would have thought that Mitsubishi would still get brand exposure ten years after the plant closed? I am glad you finally got up to the Catsburg store area because I have questions. I live in a house about a block away. I went to the helth dept to find out where my septic tank was and they had direction to my house on the car "so many yards form the rr track" what rr track. then my neighbor told me there was a rail station there. The tracks are gone now but she said the train went to VA. Also behind the catsburg store there is a foundation of a building. what was there? How can you get other pictures of this area? My house was a log cabin on Hamlin but the logs have since been covered with siding. VERY interested in seeing photos of this area back in the day. Oh yeah and my neighbor said that people used to come to the catsburg store on horses and tie them up to the posts where the gas pumps were. I remember playing little league baseball games there during the late 80's to early 90's. We even played in the championship game there. That was my favorite field. I am interested in knowing more about the train depot in that area. Was it at the Catsburg store or was it at that structure on Old Oxford HWY just past the Catsburg store. I noticed it kind of hidden in the trees the other day. What newspaper was around in the 40's? maybe information can come from there? Catsburg store was for sale for at least 10 years with no buyers. It was seriously over priced, at about double the going rate for similar land in the area. The property didn't fall into disrepair because of the current owner, it happened before they bought it, while it was still owned by sherif Belvin's children/grandchildren. As for the current owners intensions, I suspect since the plans by the county has been to extend Carver thru to Hamlin, making that a mayor intersection, having property that is already zoned for a gas station at a busy intersection would be attractive investment. I recall my baseball days in the mid 60s there. the bleachers had an overhang, the outfield was spacious with towering light poles, and the infield surface consisted of what was called then, still may be, "chapel hill gravel". you dared not slide for fear of a strawberry rash to your hine quarters. our oak grove team competed against bragtown, holt school, stem, bahama, club blvd school, maybe more. Cherylann ..I also remember they sold Ice scrapers around 1986 referencing the old lady .....I wish I had one now. She was a part of the community and very well known. I cant seem to see the cabin anymore I dont know if its overgrown with trees or was demolished ....if you turn on Thompson from Old Ox. It was right before the RR tracks on the left side. still looks like the path is still there. Anyway everyone called her something I cant recall but If i heard it I would remember. Her name was Mrs. Kitty Reagan. the reason you no longer see the log cabin that was back there is because it has been renovated like mines has and the logs are covered up. My house was also a log cabin it is the first house after the church. The two houses were owned by family members and were exactly the same house. I have photos of both of them when they were log cabins. Georgia Gates owned my house. I also have photos of the Thompson st/rd house when it was a log cabin and photos of the Gates in my back yard plowing the field with a horse and plow and the wife on an old old tractor. a little further down Hamlin Rd (maybe the 4th house from the church) is a little cinderblock house. That was also a store owned by the Parrish's. Had a pool table in it. There are a couple of people who still live in the area who have a wealth of knowledge on the area. I wish someone would document it before it leaves with them. My neighbor used to live upstairs in the Catsburg Store. She has passed on though. My Grandmother was a Thompson and her parents lived near the old pond on Thompson rd. I believe, but am not certain, that the original owner of the store was a Great Uncle. My mother and I used to walk the railroad tracks past the cabin to Catsburg to get sodas. My uncle Bobby Thompson used to work there in the 80's. Another uncle used to own the old mansion that was near catsburg. It was in horrible state last time we saw it. It was sold before the 90's and I think there were plans to level it. I have many memories of Catsburg. With all the development in that area, a specialty store (Frozen Yogart, Hot Dogs, Burger and PopCorn) would go well with Baseball. Add a couple of gasoline pumps and they would surely make a great profit. I also worked at Mitsubishi from 89-95. Night shift. Spent many a mornings drinking beer in the parking lot behind store and beside field. Good times! I'm sure the store was open 89-90 but closed sometime before 95. My kid goes to school at Little River so I still ride by there every afternoon from RTP to Snow Hill. Love that place. 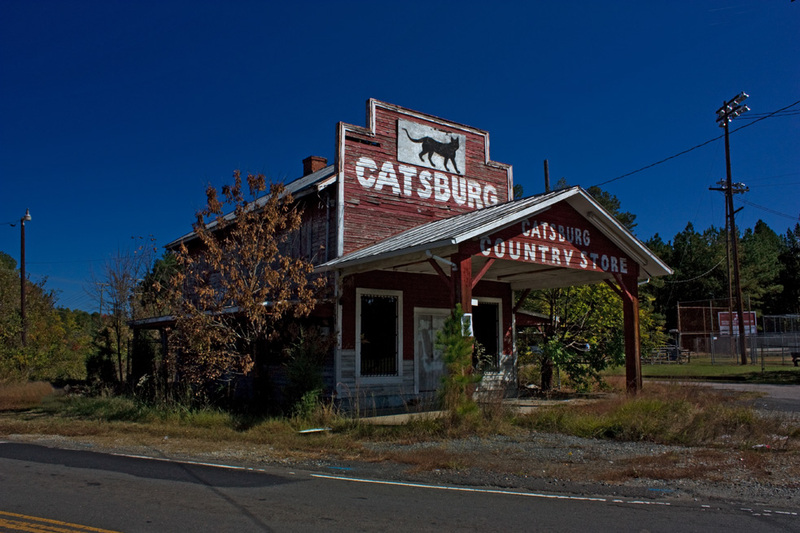 I am told the area was called "Catsburg" for "Cat Belvin" he was either the Sheriff of Durham County or the brother of the Sheriff. Will do more research. Ms. Reagan's daughter still lives close by. I used to live on Fellowship Dr. as a kid and my house backed up to Mrs. Raegan's property, her pond was just a short walk through the woods.We asked permission to fish and she was OK with it. I spent many summers riding my bike to Catsburg to get a candy, drinks, and a bucket of minnows to go fishing. Its such a shame to see the store like it is. It was in need of major repairs when I was a kid in the early 90s. I do miss that sinking floor and the jar of pickled pigs feet on the counter, not that I ever ate any. I just moved to NC from Alabama. You have so much rich history here, like the Catsburg store. Don't forsake your past. I love seeing and reading about that old store. I would have loved to have known Mrs. Raegan, she must have like another great person in our past name Raegan! Loved that old store from way back. I believe Fowler is run by Marvin Barnes, I think he is Fowler's son-in-law or so I have heard someplace. I am sure this property is a business investment. I wouldn't expect any decisions about that property that doesn't benefit MM Fowler. It is after all just another heartless greedy corporation. Does MM Fowler still own the Catsburg? I know someone who is interested in it. The Catsburg Country Store was built in the 1920s by Sheriff Eugene Belvin at the junction of Old Oxford Highway and Hamlin Road. 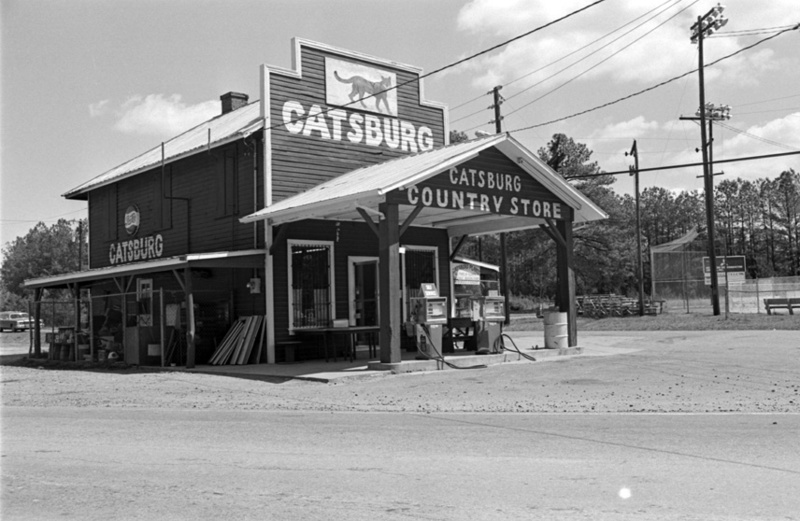 The store became an early landmark due to its high front facade with the image of a black cat above the name 'Catsburg.' Belvin, a very popular sheriff, evidently earned the nickname 'Cat' for his ability to sneak up on bootleggers in northern Durham county. (So he was at least popular with non-bootleggers.) Belvin also provided the ballpark to the east of the store for area kids, and lived nearby. The Catsburg store was still functioning in the late 1980s - I'm not sure when it was abandoned. Frustratingly, this building, which is a favorite of many people, is owned by MM Fowler, who also continues to allow two of my other favorite buildings in Durham to fall into the ground - the former gas station at Angier and S. Guthrie and the former gas station at Foster and Geer Sts.